The question is whether the body is on the ground at rest and whether it is possible to fix and measure this state, as it turned out, is able to change the attitude not to the concept of the body at rest, but to the category of time, and at the same time to receive an answer to the question posed. The question concerning the body in a state of rest excited Aristotle, who criticized atomists, saying that “no one [from recognizing the existence of emptiness, that is, atomists] will be able to say why [the body] set in motion will stop somewhere, for why it rather will stop here, not there? Consequently, he must either rest, or move to infinity, unless something more is hindered, “” Physics, “Aristotle. The reason for criticism can be considered and the principle on which the conclusions of Democritus were subsequently based: 1) there are atoms of any shape and size (including the size of the whole world); 2) all directions and all points in the Great Void are equal; 3) atoms move in the Great Void in any directions with any speeds. The first task in this case is to explain not the movement, but the reason for its change. And the above-mentioned principle of isonology is the best basis for the development of this thought. For Democritus it was obvious that if a phenomenon is possible and does not contradict the laws of nature, then it must be assumed that in infinite time and in boundless space it either once occurred, or someday comes: in infinity, there is no boundary between possibility and existence, or, if some phenomenon in principle can occur in different species, then all these species exist in reality. It can be said that later this idea was developed by Galileo, who explained the reason for the change in motion – the principle of inertia, which is the basis of modern physics. For example, the same principle is applicable in the case of the motion of our solar system and galaxy – the inertia is attached with the Big Bang. Combining a complex of knowledge (proven theorems and confirmed experiments), known and accessible to man from Hipparchus to Galileo, from the Enlightenment to Grigory Perelman, who proved the Poincare conjecture “every connected, simply-connected, compact three-dimensional manifold without boundary is homeomorphic to the sphere S3”, one can speak of a new round of astronomical theory in the philosophical context, taking into account these already well-known data. The fundamental knowledge in this work, taken as a basis, represents a new logical chain and act in a new quality. Scientific literature, numerous theories of the formation and development of the universe do not give a satisfactory answer about what is the time and what is the role of this category, except for the calendar-household convenience, explaining the change of seasons, seasonality, sunrise and sunset, etc. And thus, not the time initially in relation to phenomena, but the man needed to streamline the course of the formation and development of the universe and explain this move with the help of time. However, no evidence of the existence of time found in the universe is not possible. But somehow the universe moves and changes. Yes, and the answer to this question is speed. Let’s look at simple examples. The first elementary question: are we moving when we sit, sleep, stand? We move along with the planet, move with our galaxy, move in the universe towards the black hole. Movement occurs at a speed. And speed accompanies us constantly and everywhere. We even partly learned to control the speed at a level accessible to the person today: to develop the speed higher, if we go by car, even higher if we fly in the cabin of the aircraft, etc. And of course, there is a speed at which we do not influence – the speed of movement of the planet, the galaxy. If we replace the time for speed in this context, then we get a logical conclusion that by increasing the speed of the train or another vehicle, we arrive at the desired point more quickly. The distance is shortened by increasing the speed, and the object is faster at a given point. These are the speeds available to man and the available ways of control. But there are distances to overcome which a person is looking for solutions – speed, close to the speed of light and the speed of light, as well as speed exceeding the speed of light. At the same time, an important requirement is the safety of these speeds for a person in the existing form. I mean that we – our body – a complex protein composition, which is based on the smallest particles. And if we imagine the interaction of these particles as the motion of particles at a certain speed, take into account gravity, the speed of motion, it becomes obvious that the body is never at rest, no particle is at rest. And the combination of these speeds creates the integrity of a complex protein composition, thanks to which we are in the physical form as we see and feel ourselves. Changing, slowing the velocity of the particles, we will see the decay of the whole protein composition, and any other inorganic compounds. And the increase in speed that a person feels while driving in the cabin of any vehicle is insignificant, then what a person is able to control. The first breakthrough for man was the launch of a missile, which does not endanger the protein connections, despite the speed of the object itself. At the same time increasing the speed of interaction of the particles themselves in the protein or inorganic composition, we will encounter a compaction, possibly dangerous for unity. Thus, speed affects evolution. And we can safely say that speed affects everything, and given that the movement does not stop, we can say that everything represents a movement with speed, even from birth to death – no more than overcoming the distance from a certain speed that affects the reduction of this distance. However, speaking about the distance between birth and death, it is necessary to take into account the factors that affect the reduction of this distance, allowed by man – the harmful effect on the body – diseases, alcohol, tobacco, ecology, malnutrition, etc. The explanation of the model of the motion of galaxies to the black hole requires special attention from the point of view of the proposed theory. Due to increased speed, a person is able to compress space. This statement extends to any distances, both from the Big Bang and the Big Bang, as well as after the entry of all matter into a black hole, respectively, these distances can be drastically reduced. In this case, a person faces a series of successive tasks: to overcome the speed of light, to make a speed that exceeds the speed of light safe for man, to learn to control the speed and deviate from a given trajectory of a straight line and beyond a straight line that closes on itself. Anticipating the description of the idea of the universe as a straight line, I will explain that it is possible to speak about the universe as a straight line – a circle closed on itself – on the basis of the hypothesis Poincaré proved by Grigori Perelman, and expanding it in a philosophical way. Thus, if we assume that the circle is homeomorphic to a donut, which is true for their surfaces (two-dimensional torus) and for filled bodies (three-dimensional manifolds with boundary), and also, according to the scientists’ explanation, that if we take an infinite line (one-dimensional analogue space), add to it one “infinitely remote” point, considering that when moving along a straight line to the right or to the left, we finally get to this point, then topology there is no difference between an infinite line and a bounded open segment (without endpoints). Such a segment can be continuously bent in the form of an arc, close the ends and paste the missing point into the junction point, thus obtaining a circle-a one-dimensional analogue of the sphere. 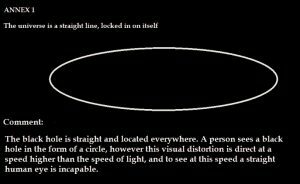 Scientists suggest that if one point “at infinity” is added to the physical space (considering it an unbounded Euclidean space) so that when you move along a straight line in any direction, you enter it (that is, each spatial straight line is closed in a circle) . Also, for a representation within the framework of the theory under consideration, it will not be superfluous to explain that by choosing three mutually perpendicular directions: forward, left and up – assume that when moving in either direction, there will be a return to the starting point, but from the opposite direction. 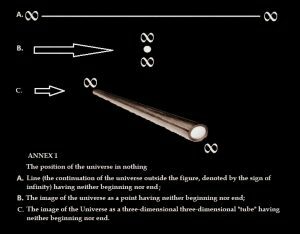 However, the absence of the beginning and the end of the line makes the point at the same time – the entry point and the exit point to the straight line with access to the Big Bang. Also, the theory in question does not contradict the proof of the Poincare conjecture in the part that any closed curve turns into a circle, after all. And when describing the universe as a straight line, one can imagine a similar model, if we take as a basis that everything moves constantly at any speed, and as the speed increases, the curve straightens. Within the framework of the theory under consideration, the following idea of the universe is proposed, taking into account the knowledge known from the scientists of ancient Rome, the universe as direct. This conclusion is based on the fact that perfect spheres are considered a sphere, an ellipse, and a generally accepted representation and image of planets, movements of planets and galaxies, the universe is connected with these forms. And if we imagine the universe as a sphere, it is obvious that it is locked in itself, and consequently, has neither a beginning nor an end, i.e. meets the requirements for a direct, also not having a beginning or an end. On this basis, within the framework of the proposed theory, the universe should be viewed as a straight line. In another projection, the universe (as a straight line) will represent a point. Both the straight line and the point are located in nothingness that has always existed. In this part, the theory is based on knowledge from Democritus and Euclid, to Ibn Sina and Al-Farabi. The straight line, having neither beginning nor end, is a closed cycle – from the Big Bang to the next Big Bang, and we can assume that such a cycle could be repeated as many times as necessary and will be repeated as many times as necessary. In this case, a black hole – a straight line that is visible to the human eye, exceeding the speed of light – is a consequence of the apparent distortion of our space at a low speed, and as the speed is increased above the speed of light – the black hole appears as a straight line. It should be assumed that a black hole is not a specific place in the universe or a certain set of black holes, but a straight line located everywhere. Thus, the set of black holes we see is nothing more than a single direct distorted for human vision. It can be said that the human eye can not see the straight line at a speed higher than the speed of light, and it is with this that the person’s idea of a black hole is associated with a ring, a hole that pulls everything into itself. In turn, the development of speed above the speed of light will make it possible not only to deviate from the trajectory and go beyond the straight line, i.e. how not to get to the point of the Big Bang, and get out into nothing. Also, speed control will allow you to get to any point of formation and development of the universe, i.e. whether it is the moment of the Big Bang or other stages of the universe’s formation. Speed control above the speed of light also makes it possible to escape from the impact of the acceleration imparted by the Big Bang, to eliminate the spatial curvature, to move in a straight line at a given speed, without getting into the finest chain of the smallest particles on the eve of the Big Bang. According to the theory under consideration, such a level of speed control above the speed of light will be possible on a spaceship with a motor to exceed the speed of light, and its design and materials used are so perfect and durable to ensure the safety of such movement to humans.